- Description based on: Vol. 1, no. 3 (Oct. 21, 1943). Relocator News Week . [Rivers, Ariz., December 2] (Rivers, AZ), Dec. 2 1943. https://0-www.loc.gov.oasys.lib.oxy.edu/item/sn94050511/1943-12-02/ed-1/. 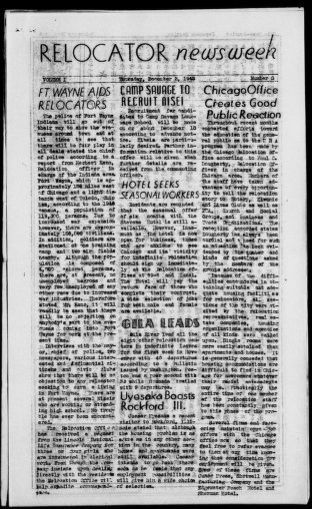 (1943, December 2) Relocator News Week . [Rivers, Ariz., December 2]. Retrieved from the Library of Congress, https://0-www.loc.gov.oasys.lib.oxy.edu/item/sn94050511/1943-12-02/ed-1/. Relocator News Week . [Rivers, Ariz., December 2] (Rivers, AZ) 2 Dec. 1943. Retrieved from the Library of Congress, www.loc.gov/item/sn94050511/1943-12-02/ed-1/.